United Nations Ambassador Nikki Haley says the U.S. will take action if the Security Council does not respond to the attack, whose victims showed signs of nerve gas exposure. BEIRUT — Diplomats on the U.N. Security Council sparred Wednesday over whether to hold President Bashar Assad’s government responsible for a chemical weapons attack that killed more than 80 people Tuesday in northern Syria, while U.S. intelligence officials, Doctors Without Borders and the U.N. health agency said evidence pointed to nerve gas. The Trump administration and other world leaders said the Syrian government is to blame, but Moscow, a key ally of Assad, said the assault was caused by a Syrian airstrike that hit a rebel stockpile of chemical arms. Early U.S. assessments showed the use of chlorine gas and traces of the nerve agent sarin in the attack on the Syrian town of Khan Sheikhoun, according to two U.S. officials who weren’t authorized to speak publicly on the matter and demanded anonymity. Israeli military intelligence officers also believe Syrian government forces were behind the attack, Israeli defense officials told the Associated Press. Israel believes Assad has tons of chemical weapons, despite a concerted operation three years ago by the Organization for the Prohibition of Chemical Weapons to rid the government of its stockpile, said the officials, who spoke on condition of anonymity because they weren’t authorized to brief the media. Turkish President Recep Tayyip Erdogan also blamed the Syrian government for the attack. In Khan Sheikhoun, rescue workers found terrified survivors still hiding in shelters as another wave of airstrikes battered the town Wednesday. Those strikes appeared to deliver only conventional weapons. Victims of the attack showed signs of nerve gas exposure, the World Health Organization and Doctors Without Borders said, including suffocation, foaming at the mouth, convulsions, constricted pupils and involuntary defecation. Paramedics used fire hoses to wash the chemicals from the bodies of victims. The magnitude of the attack was reflected in the images of the dead – children piled in heaps for burial, a father carrying his lifeless young twins. Tuesday’s attack happened just 60 miles from the Turkish border, and the Turkish government – a close ally of Syrian rebels – set up a decontamination center at a border crossing in the province of Hatay, where the victims were initially treated before being moved to hospitals. At the United Nations, U.S. Ambassador Nikki Haley warned that the Trump administration will take action if the Security Council does not in response to the attack. The council was convened in an emergency session to consider a resolution that would back an investigation by the chemical weapons watchdog and compel the Syrian government to cooperate with a probe. It was drafted by the U.S., Britain and France. 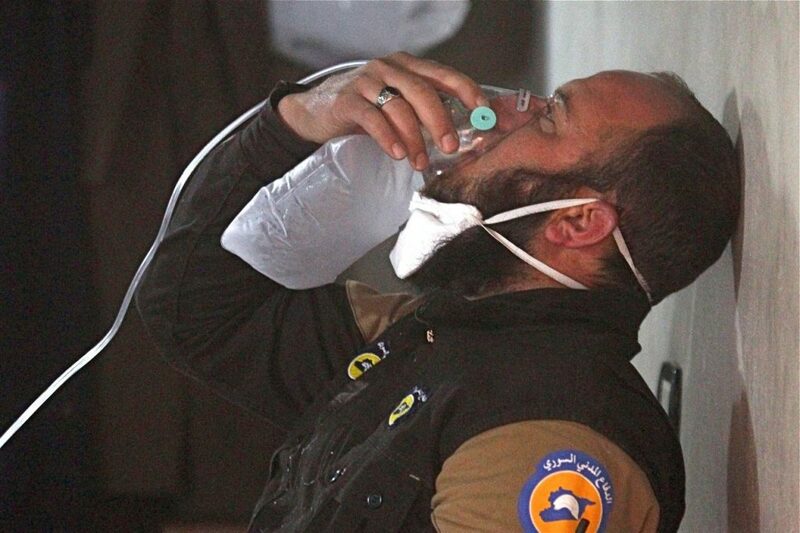 Syria’s government denied it carried out any chemical attack on Khan Sheikhoun. Russia’s Defense Ministry said the toxic agents were released when a Syrian airstrike hit a rebel chemical weapons arsenal and munitions factory on the town’s eastern outskirts. A top Syrian rebel representative said he holds U.N. mediator Staffan De Mistura “personally responsible” for the attack. Mohammad Alloush, the rebels’ chief negotiator at U.N.-mediated talks with the Syrian government, said the envoy must begin labeling the Syrian government as responsible for killing civilians. He said the U.N.’s silence “legitimizes” the strategy.